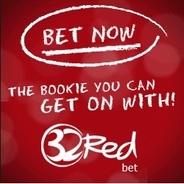 32Redbet are owned (not suprisingly) by the 32Red Plc Group who have long been the number one Casino operator on the Internet. They are a Britsh company but incorporated and based in Gibralter. There is an instant chat, phone, skype, post and email customer support who are swift in response, if a tad bureaucratic! Odds are taken and seem to mirror those of Betdaq so are never quite as good as those on the exchange. Deposits and Withdrawals are swift and free but using the "Cashier" as the main wallet between accounts can be confusing. They have occasional enhanced odds offers and promotions and very very occasionally "freebet" offers too.